My name is Adrian Jackson and I am qualified registered plumber based in Worthing, West Sussex. I mainly cover the Sussex region but I can travel further afield on request. Plumber On Tap provides an efficient, reliable plumbing service that offers small plumbing repairs through to larger plumbing installation projects, including complete bathroom refurbishments and the installation of high specification showers and wet rooms. As an experienced plumber and shower specialist I can supply and install replacement parts to get your shower working properly again, or can upgrade your system completely with the fitting of a new shower system. 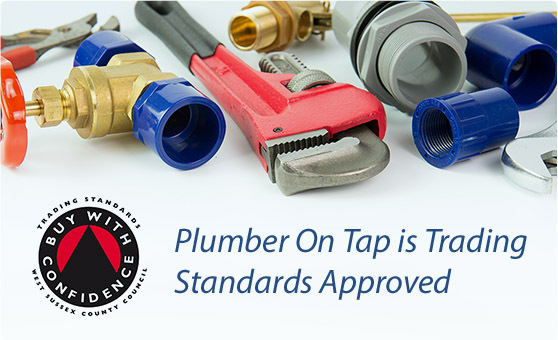 To give customers piece of mind Plumber On Tap is registered with Sussex Trading Standards Buy With Confidence scheme. If you are unsure as to whether Plumber On Tap can assist you, or would like some advice before moving forward with your project, just contact me and I will be happy to discuss. I am writing to thank Plumber on Tap for the professional and proficient manner in which he completely refurbished my bathroom. I would certainly use him again and would recommend Plumber on Tap. My wife and I are very grateful to Adrian at Plumber On Tap for the very high quality of service he provided with his solution to our shower replacement. Adrian gave us sound advice with product recommendation and an efficient installation of our new digital shower. We have no hesitation in recommending him. I can wholeheartedly recommend Plumber On Tap. Adrian installed a new shower and sorted out my antiquated bathroom plumbing extremely efficiently I was impressed with his skill and professionalism..
Another Fantastic Web Breakfast Website Design.